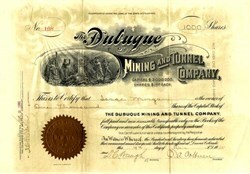 Beautiful uncancelled RARE certificate from the Dubuque Mining and Tunnel Company - Colorado printed in 1905. This historic document has a vignette of men working underground and the company's name in fancy print. This item has the signatures of the Company’s President, Judge Ernest A. Colburn and A. Secretary, D. C. Waugh and is over 105 years old. Colburn Automobile Company was founded in 1906 by Judge E.A. Colburn. Located near Idaho Springs, Clear Creek County, Colorado. Two claims. Gold and copper. Incorporated December 4th, 1905, Colorado laws; capitalized at $2,000,000—2,000,000 shares, par $1. Developing by tunnel. Officers: E. A. Colburn, President; W. W. Kirby, Vice President, and J. A. Wright, Secretary and Treasurer. Main office, Colburn, Building, Denver, Colorado.